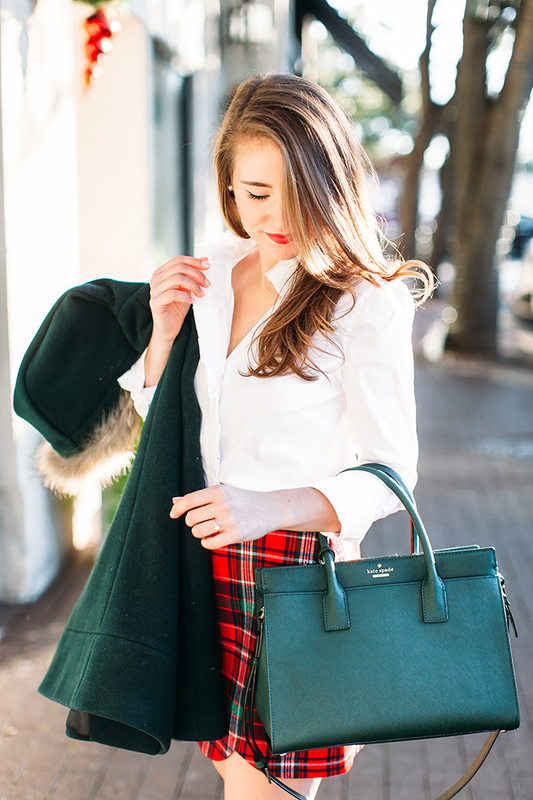 Plaid + Scallops. I don’t think I could dream up a more perfect Christmasy combination if I tried! 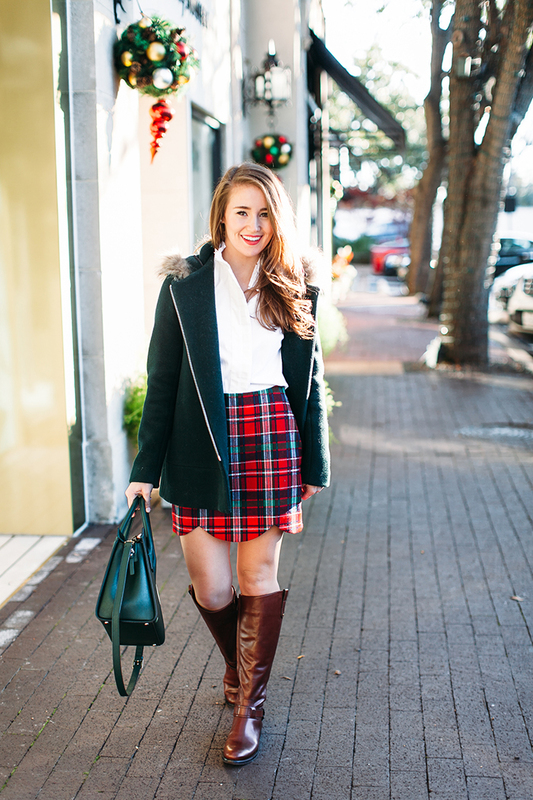 If you know of my love for classic, preppy pieces, it shouldn’t surprise you that I am head over riding boots in love with this perfect Christmas Tartan skirt from Vineyard Vines. I’ve received a few questions about what I’ll be wearing for Christmas eve (my family always heads to church and then straight to a Mexican tamale dinner) and I’m happy to say you’re looking at it! Depending on the weather… as it’s been dishearteningly warm here in Dallas lately… I might throw on tights and a festive red sweater to make it a little more winter friendly. Also debating on whether or not I’ll swap out the riding boots for my favorite pair of lace-up heels. Decisions, decisons! Luckily, I know I’ll definitely have this beautiful green coat to keep me warm. 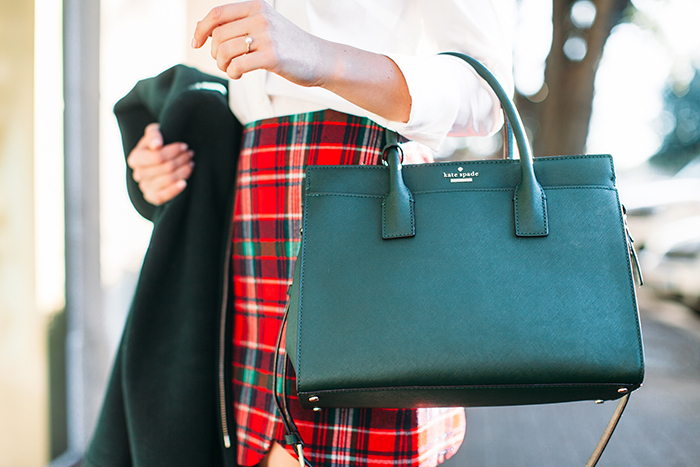 Deep, hunter green is one of my favorite shades of all, and I love how it ties the coat, skirt and bag together! I actually purchased this Sandro coat on my recent trip to Paris. While it’s sold out in green, this J.Crew style is incredibly similar with a much friendlier price tag! Have you decided what you’ll be wearing to celebrate Christmas in? I want to hear! that skirt! and those colors! (heart eyes) Thank you for inspiring my christmas day outfit! 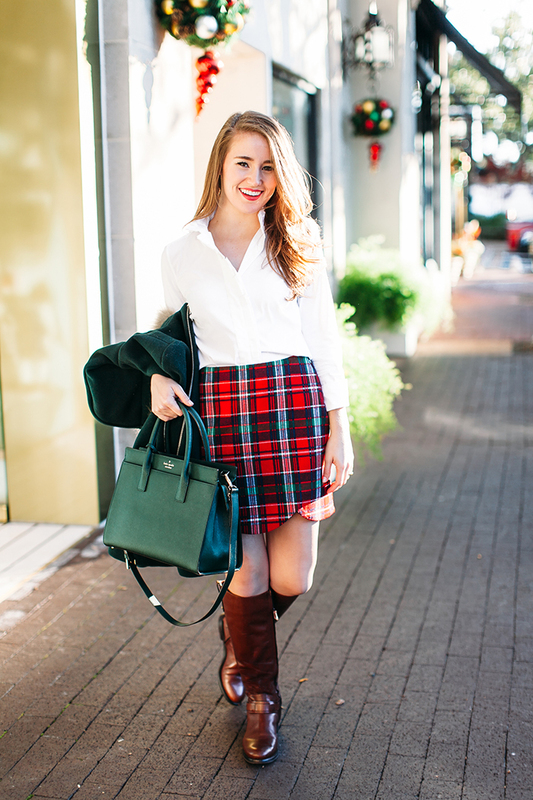 I am IN LOVE with all things plaid and all things scalloped, and to put them together? I’ve died and gone to heaven. Maybe I’ll splurge so I have a cute new outfit for the holidays! I love the scallop detail! This skirt is too adorable! I think I am going to wear a burgundy swing dress and Christmas-like cardigan! I love that skirt! I would definitely buy that if I could try it on before buying. It’s so cute on you. I’ll probably be wearing an oversized teal sweater with leggings and boots.. so fashion forward, lol!! Kate…you look adorable!! That skirt could not be more perfect for this time of the year but I love how the hem is scalloped! Great coat too! Have a wonderful Wednesday! Oh how cute! 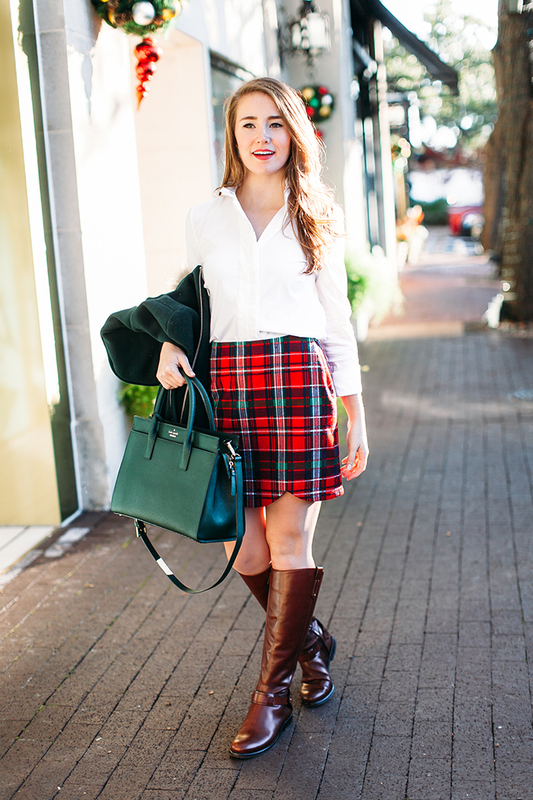 I love that the classic plaid skirt has the added scalloped touch here. Perfect holiday look! Love love this festive skirt! Perfect for Christmas Eve! A festive tamale dinner sounds so fun too! This outfit is gorgeous! Obsessed with that skirt! great tips. i dont know what ill be wearing for xmas yet but will be soon. 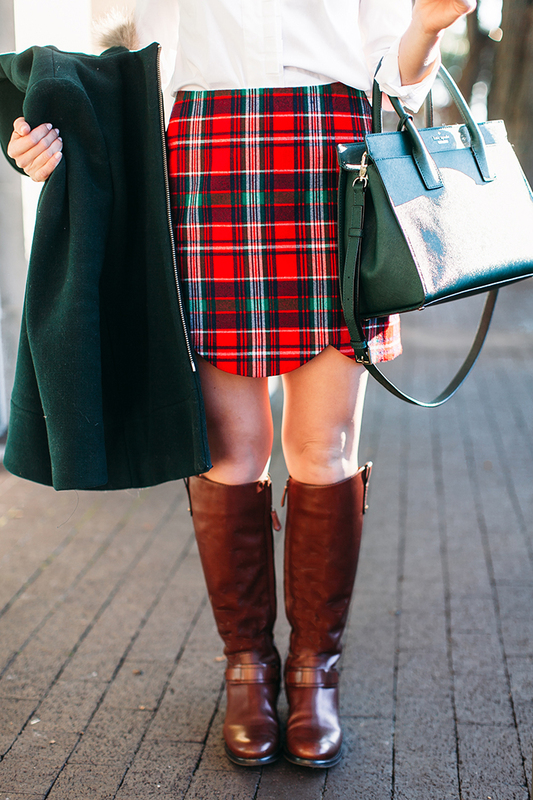 LOVE the tartan skirt! I just went to Scotland this past summer and I have become obsessed with different tartan prints, but this scalloped skirt is just too adorable!